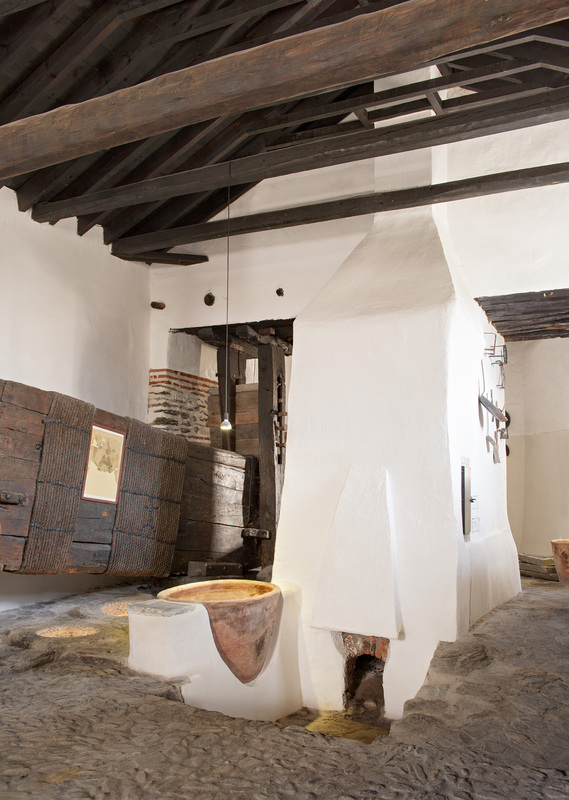 The Almazara of Laerillas produced oil until the 1940s. From then to the 1990s it was used as a storage space, remaining in a semi-ruinous state. Some of the buildings gravely deteriorated, especially their roofs and walls, however, the machinery was kept in relatively good shape. 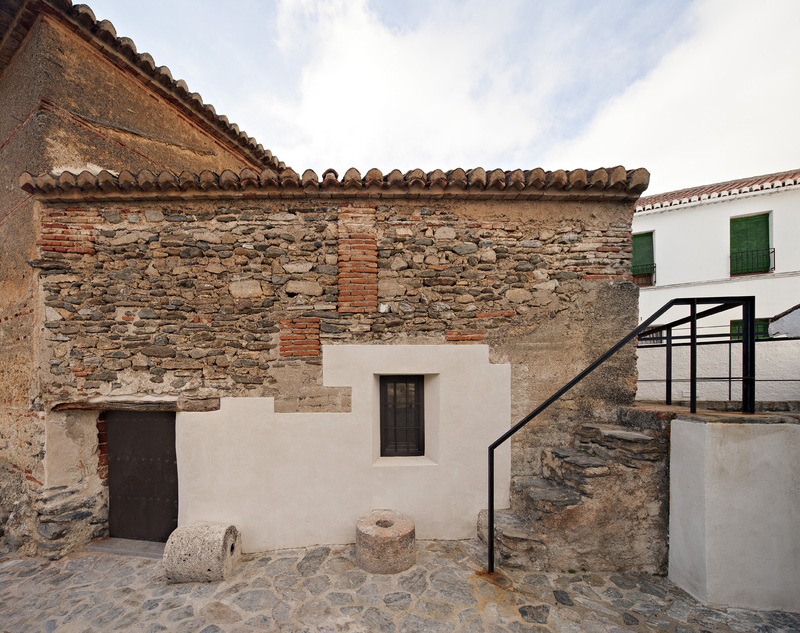 In 1991, at the initiative of the Nigüelas council, it underwent restoration. 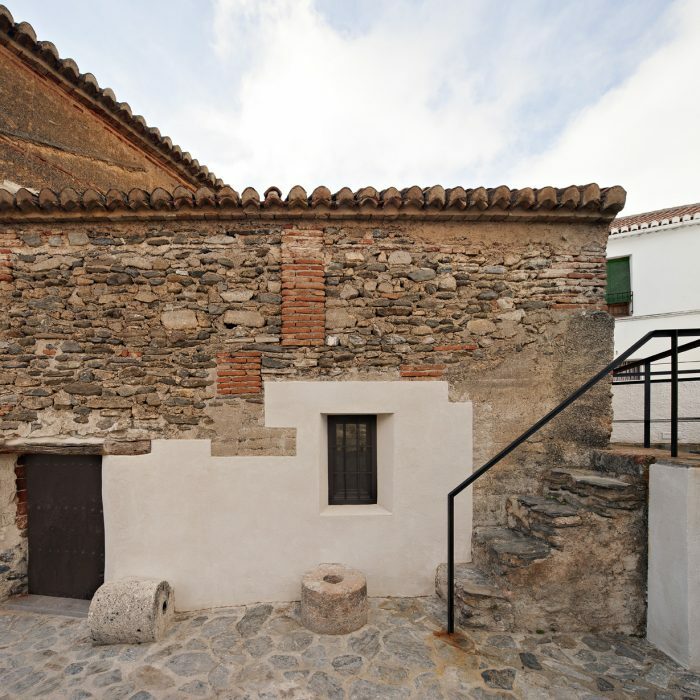 This intervention led to the conservation of the entire complex and entailed the partial restoration of the exterior walls and the floors, as well as the reconstruction of all of the roof structures and the changing of the windows and doors. In the year 2000, the building was a preliminarily musealized, with the use of signage that didactically explained how the almazara worked. This intervention gathered the information to do so from the last master mill man who had worked there, Blas Fernández Padial. 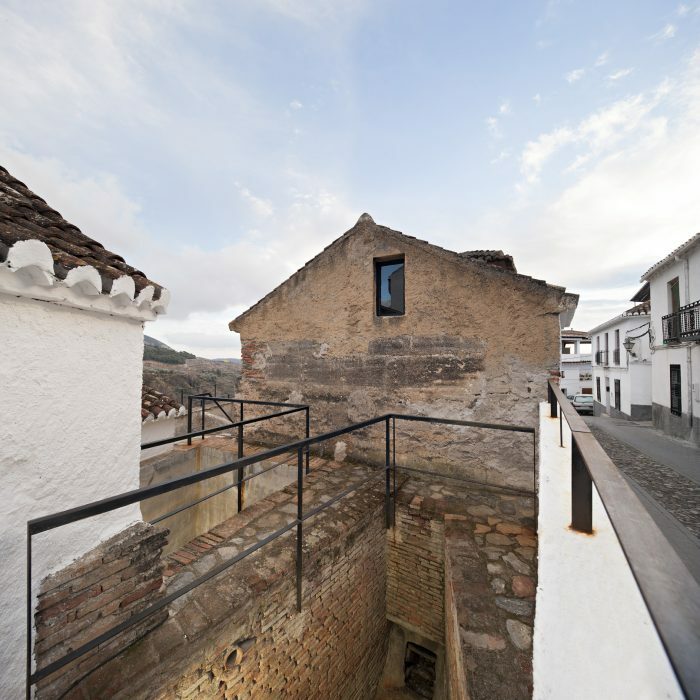 The building’s adequate preservation as well as the good state of its original equipment can be attributed to the efforts of its last owner, Doña María Antonia Zayas Fernández de Córdoba y Ossorio Calvache as well as the work carried out on the mill at the end of the 20th century. 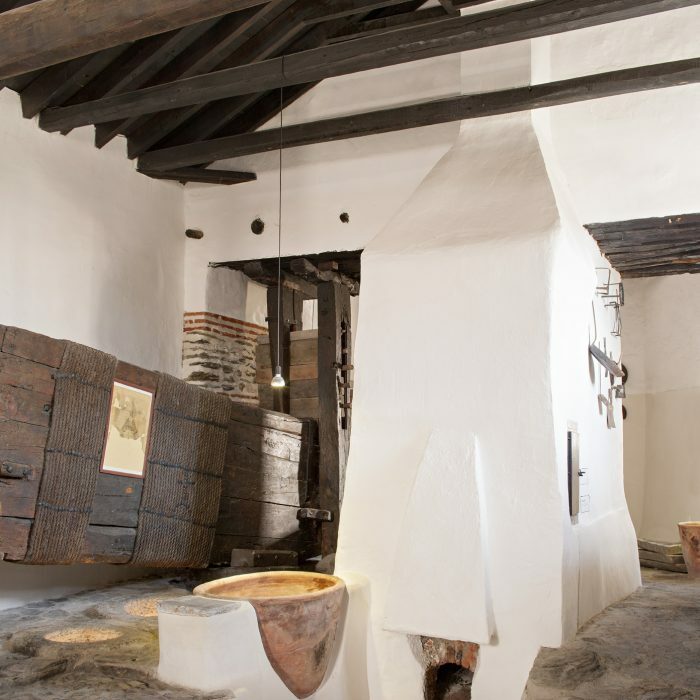 In 2014, the Fundación Zayas, with the support of the Andalusian regional government and through European Union funds, promoted the restoration and updating of the museum’s contents. 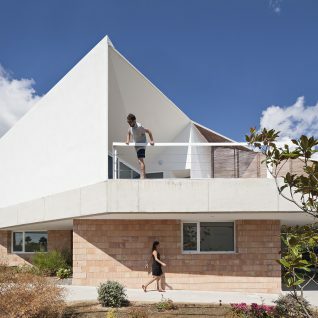 This project has been directed by the architect José Luis Muñoz Muñoz. 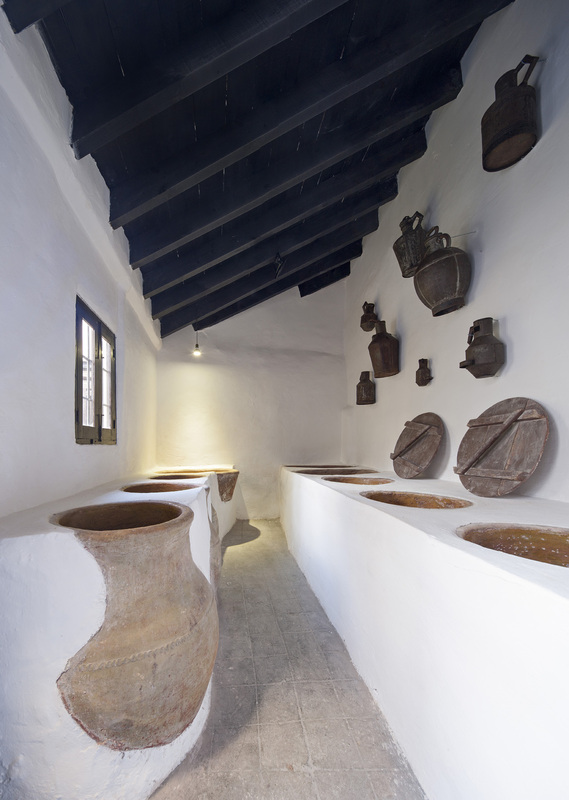 The result is what we now know as the “Museum of the Almazara of Las Laerillas”. 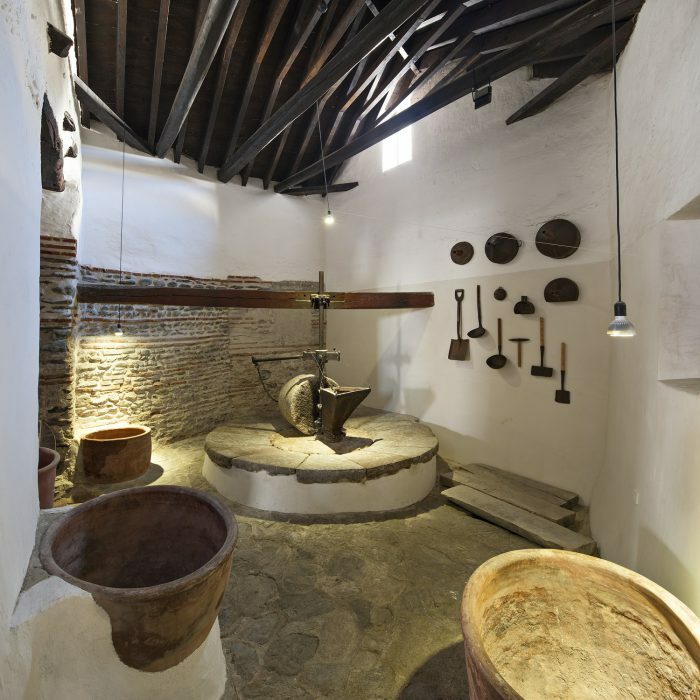 Along with the Almazara’s architectural restoration project and that of its equipment, the intervention carried out in 2015 included the improvement and enhancement of its museographical contents. The most up-to-date ways of spreading and promoting cultural heritage have been implemented. 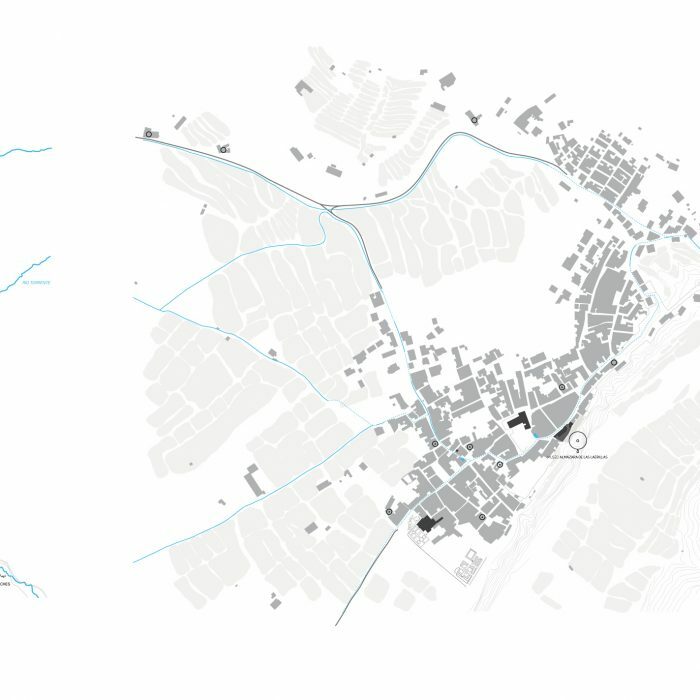 The goal of this new musealization project is to communicate the origin of the Almazara and the way it worked, as well as to show its relationship with its surroundings, all in the most didactic way possible, while also respecting what is already there. 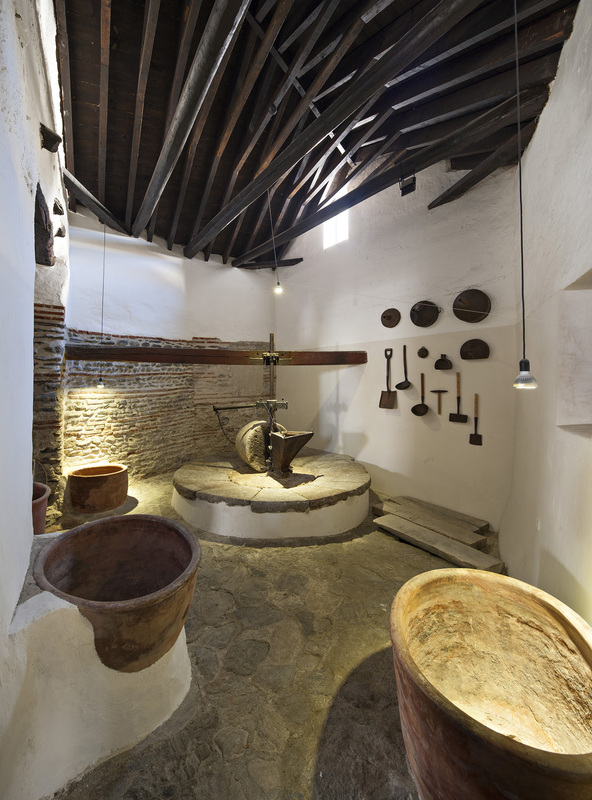 The new museum’s content consists of the restored buildings themselves, the machinery and the objects that have been preserved—shown in a logical and orderly format, along with other features that illustrate the origin and the evolution of the different typological aspects that are part of the district’s network of hydraulic infrastructures. This is achieved through the use of diverse physical (tags an panels) and audiovisual (video) devices. The museum has been laid out so that the visitor can follow an itinerary that enables the comprehension of the complex in its entirety. 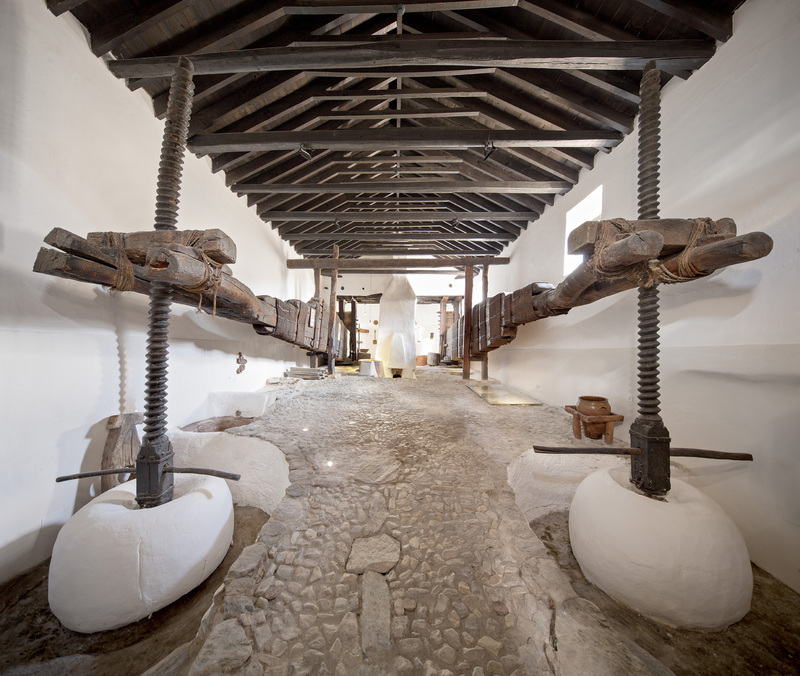 It begins in the patio de trojes (granary courtyard) and the animal traction mill. 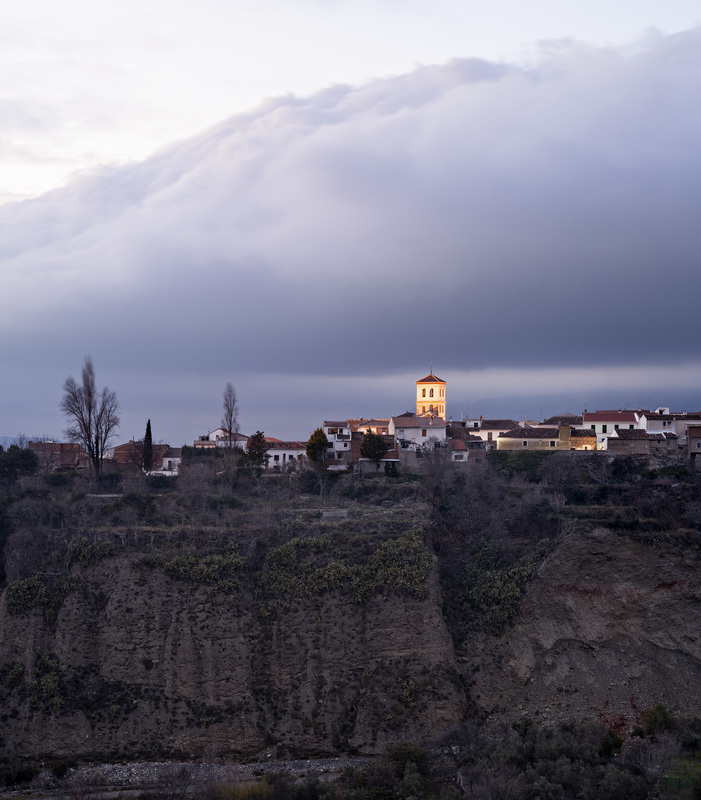 In this space, a video summarizes the origin of the Lecrín Valley’s hydraulic infrastructures and how the Almazara of the Laerillas itself functioned. Within this same space, a series of panels illustrate the district’s history, its network of hydraulic infrastructures, and drawings of other mills in the area are shown. After this introduction, the itinerary proposed shows the oil production process. 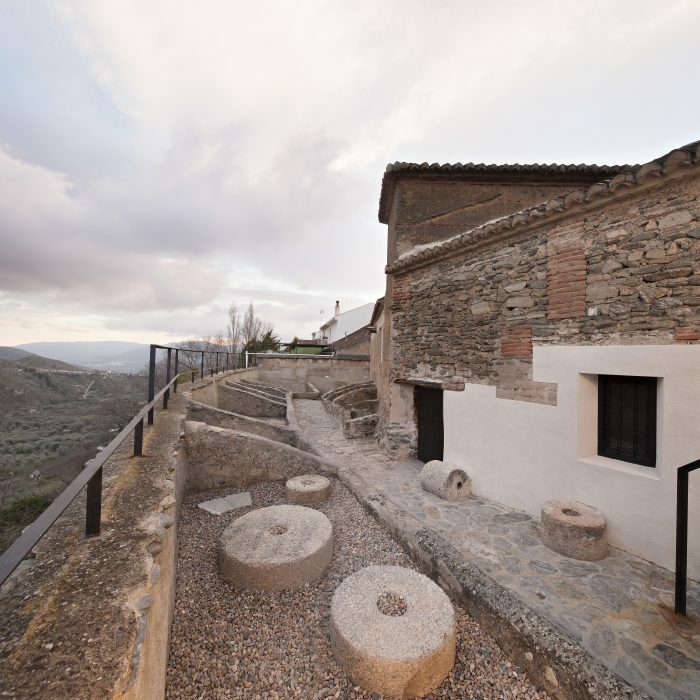 To do so it follows the cycle of olives: how they are deposited in the granaries, how they are ground, how they are pressed and finally, how the oil they produce is sold. 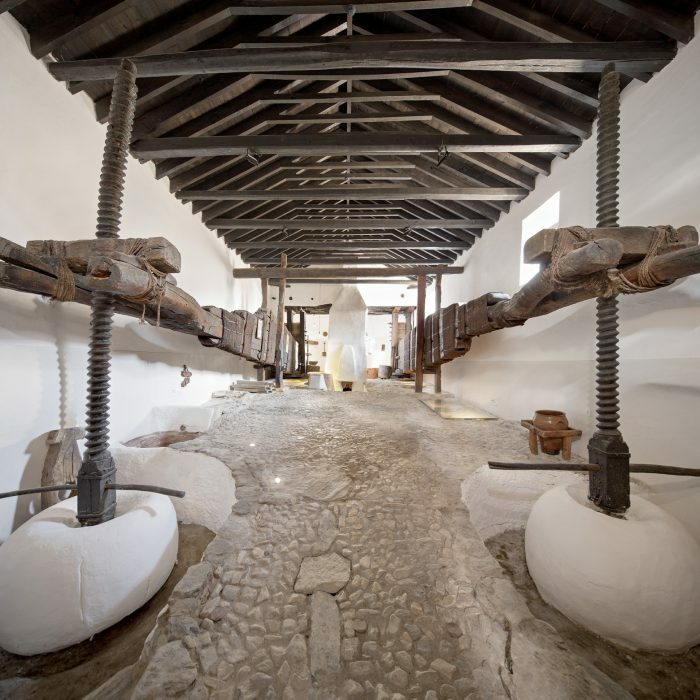 This itinerary begins in the patio de trojes, from which the cárcava and the water in it can be seen, it continues through the building—entering the hydraulic mill, then passes through the press room to finally end in the storage and selling space. There is wall space in each room where which objects and instruments that relate to each area are exhibited. Ceramic tags that are embedded into the walls adequately name and explain everything.Within the hydraulic mill space visitors are able to see the original waterwheel. 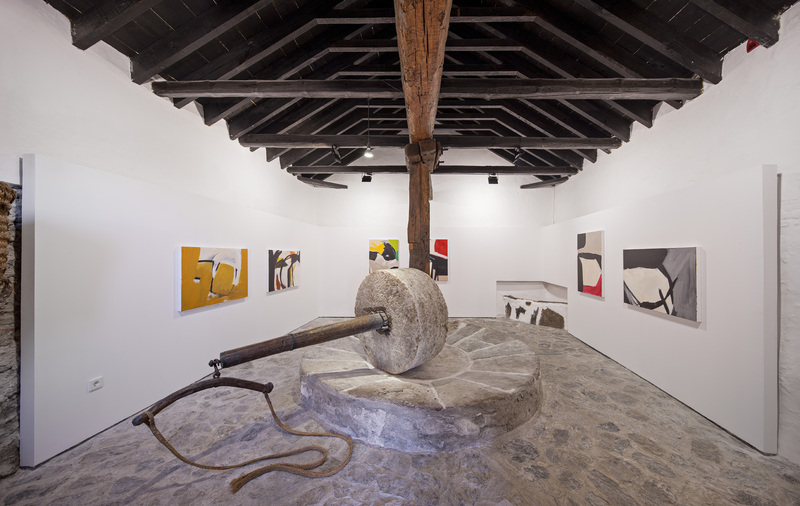 It is placed under the floor structure, under a stone vault, next to the saetillo. These elements are crucial in order to understand how the hydraulic mill was powered. 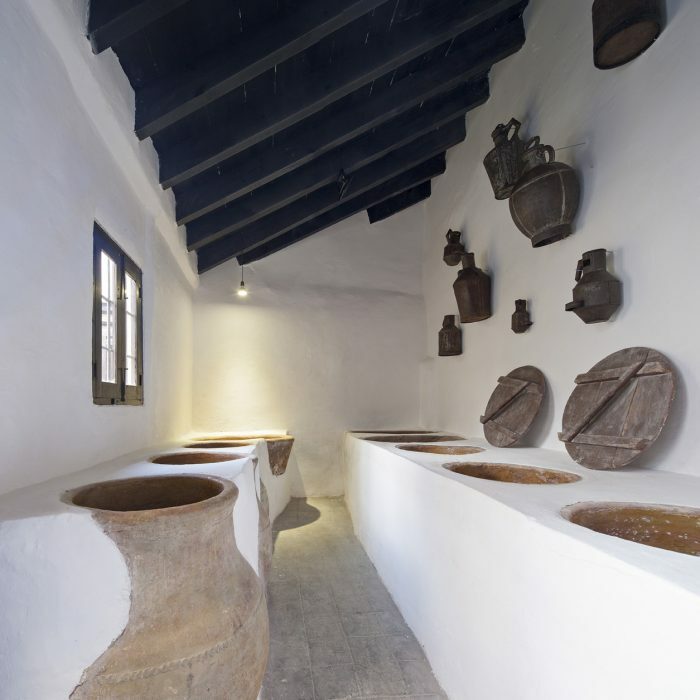 As such, they play a key part in comprehending the way the entire Almazara functioned and its relationship with the irrigation ditch that runs along Canalón street. Besides the exhibition materials that appear throughout the itinerary (the video, the panels, and the tags), the museum also includes a series of complementary educational materials, such as a catalogue, a plan of the building and a web page. The Almazara of Las Laerillas is also equipped to host other public and cultural activities in two of its spa­ces. 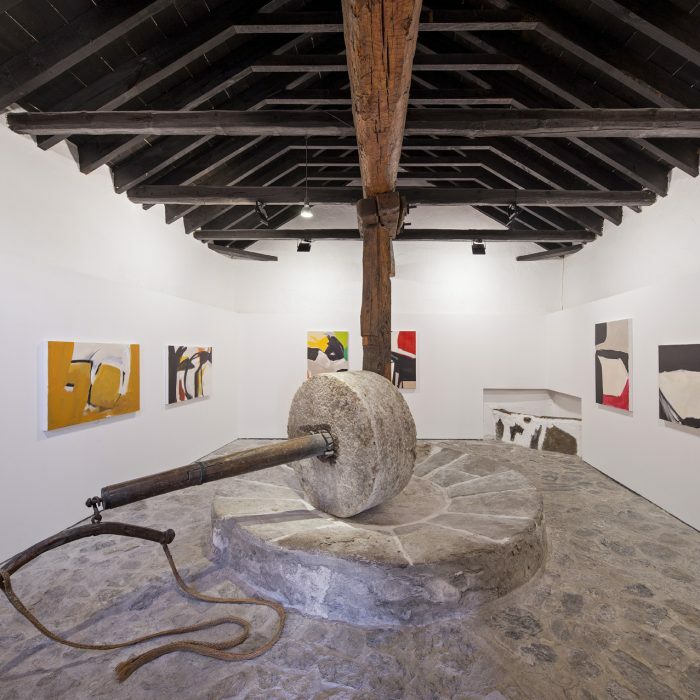 The animal traction mill can be turned into a tem­porary exhibition space and the press room, thanks to a simple mechanism, can become and auditorium. Thanks to the 2015 intervention, the Almazara has reached its full potential and cultural capacity. 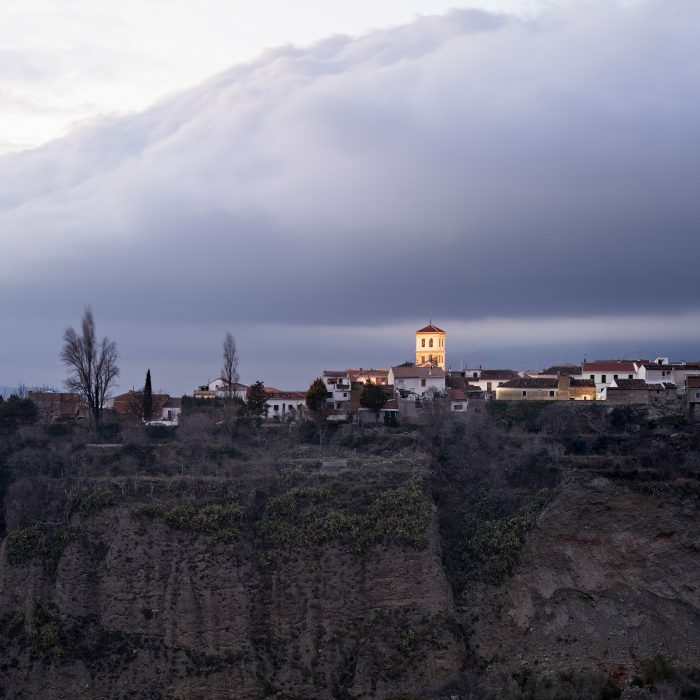 It shows that a heritage asset is not only a space which can be visited, but that it can also generate activity in itself, while at the same time it can become part of and enrich the network of cultural spaces that exist in the Lecrín Valley and the province of Granada. 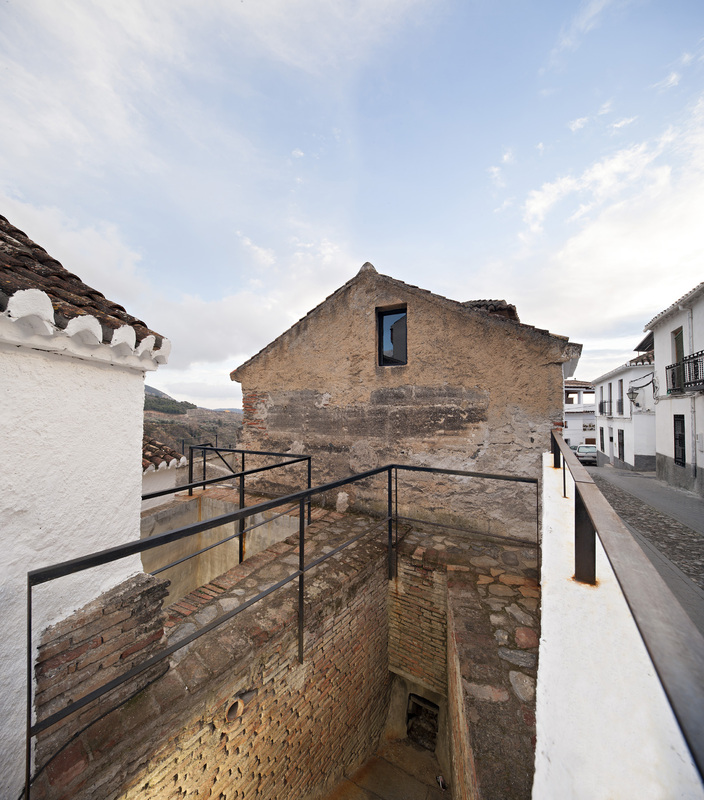 The architectural intervention that was carried out in 2015 shows the commitment of the Fundación Zayas, and that of the design team, to preserving and enhancing the building’s uniqueness as well as its machinery. With this in mind, a previous research project has been carried out that has allowed us to asses and decide aspects regarding certain construction and aesthetic issues. 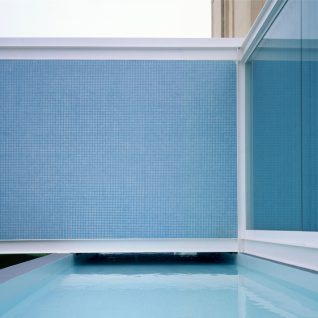 Thus, in order to improve the building’s conditions, certain materials and solutions introduced in the 1991 refurbishment have been eliminated. There are two reasons behind this: the first, because they accelerated the deterioration process, and the second, because they altered the building’s original layout. 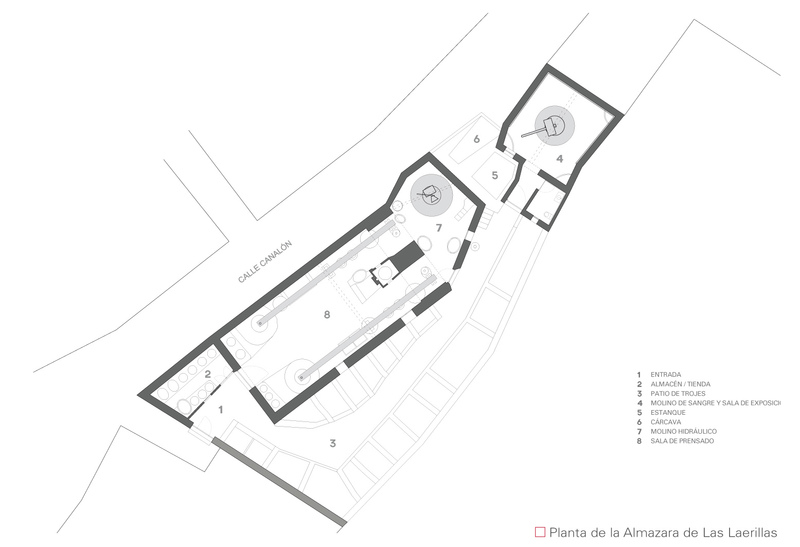 The intervention, which was carried out both archi­tecturally and programmatically, is based on the idea of recognizing the Almazara’s original configuration, both spatially and materially. 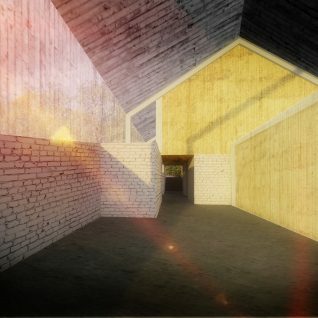 The design follows the premise of respect to what there is, in such a way that the introduction of new elements that will enable the museum’s comprehension or its adaptation to other uses will take place without endangering the heritage values of the complex or those of each of its parts. 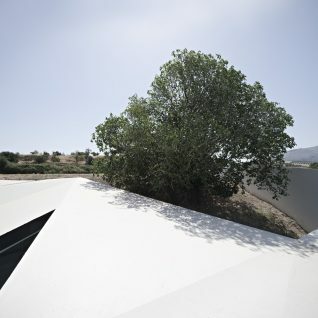 The architectural design of the new museum has been approached at several levels: the restoration of the architectural elements and objects that have deterio­rated; the substitution of added elements and installa­tions, the adaptation of spaces for new uses and the new musealization project. 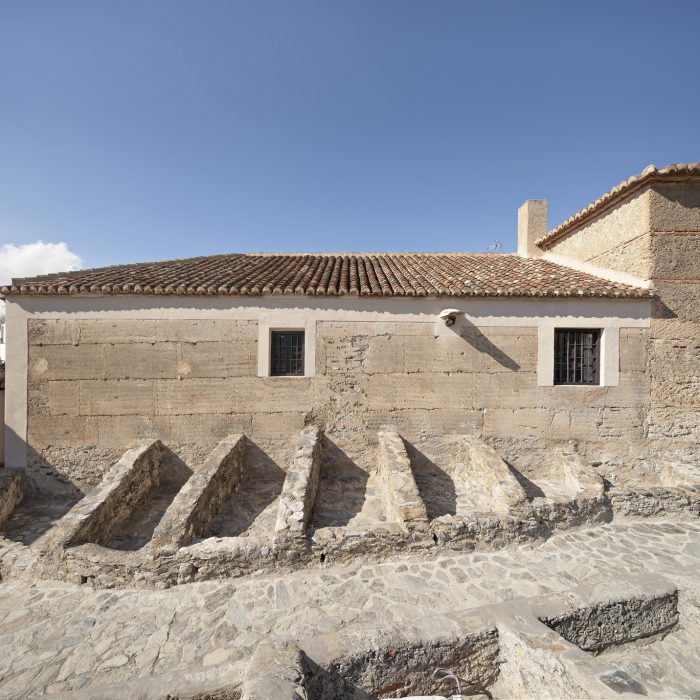 Restoration work has focused on the superficial finishings of the walls and of the granaries, the reinforcement and reconstruction of the wall openings, repairs in the pavements and the cleaning of original features. 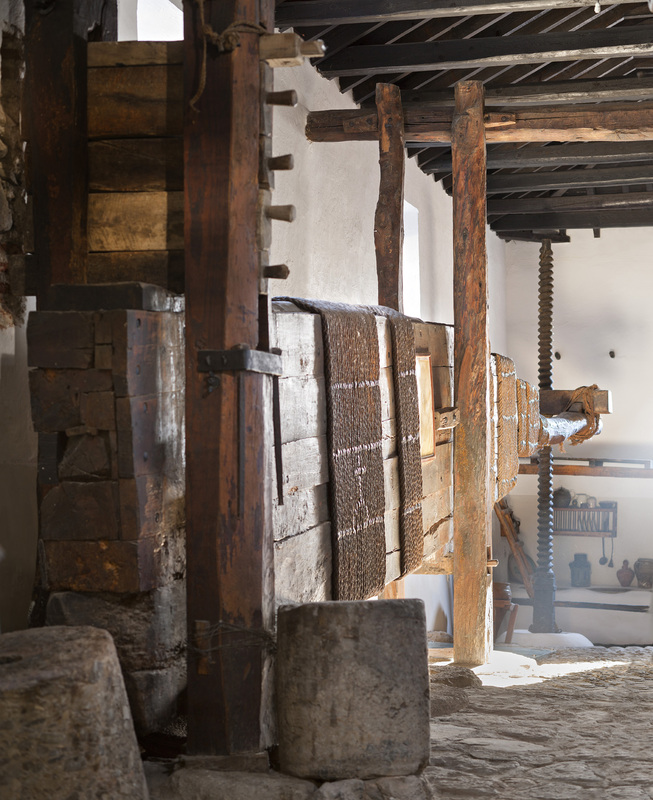 Here we need to highlight the detailing of the solution used in order to eliminate the humidity that existed on the base of the walls of both the animal traction mill and the hydraulic mill. Special lime-based mortars have been used in order to avoid humid spots from appearing due to the capillary action of underground water. The refurbishment and substitution of the elements that were incorporated in the 1991 restoration and which can now be improved or that are currently dee­med unnecessary have been substituted in the 2015 restoration, such as all of the railings and existing ins­tallations. The electrical installation has been comple­tely updated; its wiring has been hidden and light fix­tures have been substituted for more efficient lamps. The bathrooms have been refurbished so that they comply with accessibility regulations. The railings have been replaced by others with a different design that allow better views to the Torrente river valley and the patio de trojes as well as to permit the adequate view of the Almazara from Canalón street. The new uses that the 2015 design proposes are the adaptation of the press room so that it can also be used as an auditorium, as well as the adaptation of the animal traction mill so that it can also be used as an exhibition space. The nave of the main building, where the press beams are situated, can be adap­ted by implementing temporary elements, such as a platform supported by a removable steel structure, a roll-up screen for projections (fixed, but hidden from view) and 41 foldaway chairs. This space can be used for concerts, conferences and video projections. The three back walls of the animal traction mill have been clad with plasterboard, where graphic work can be exhibited. 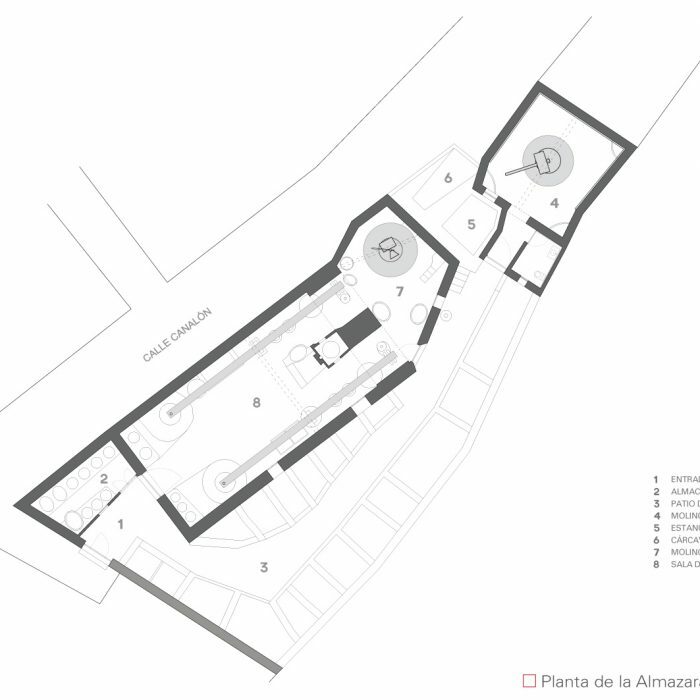 As for the new musealization for the Almazara, the project carried out has improved the way in which the building and its installations are perceived, as well as the relationship between the complex and its sur-roundings. 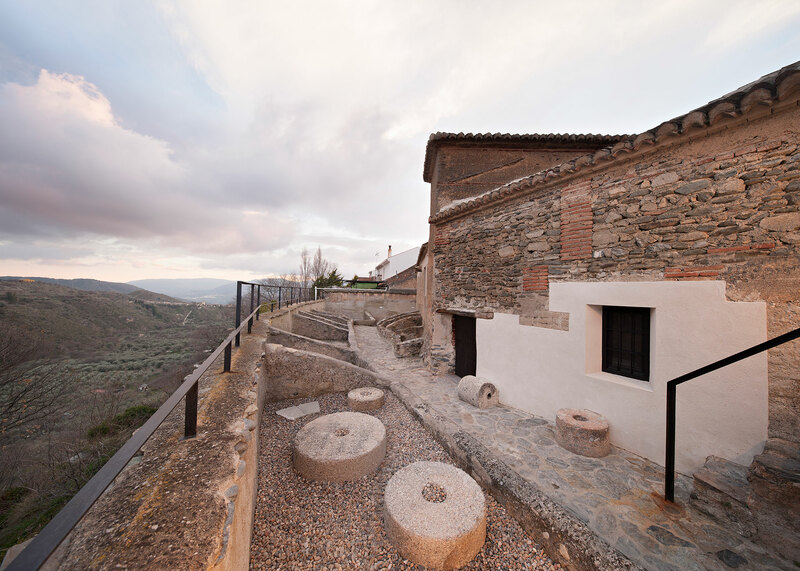 Besides repairing the walls and chan­ging the railings of the patio de trojes, an outlook has been incorporated into the space of the upper­most granary, overlooking the Torrente river valley. 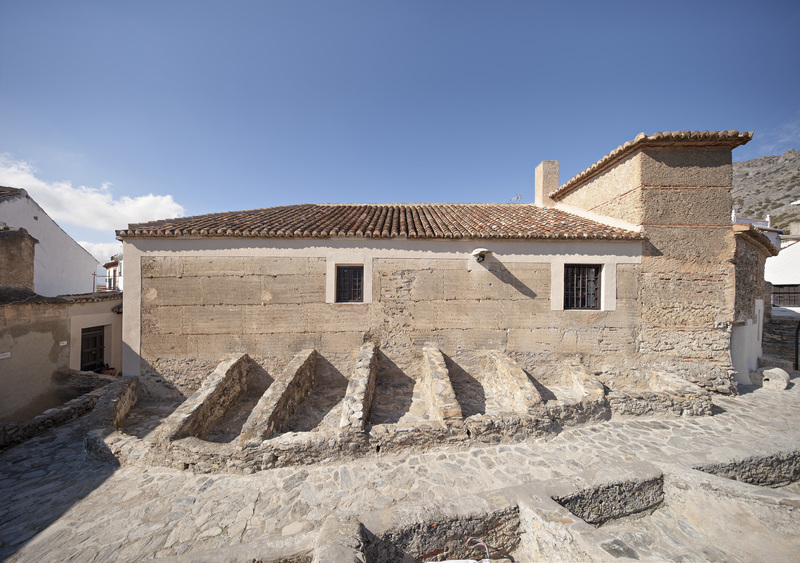 It has been built using grinding stones and flooring elements that belong to the Almazara, as well as gravel from the quarries of Padul. The cleaning out of the small wells and underground channels in the nave has helped to reveal how oil circulated under the room’s floor structure. Likewise, the partial demolition of this floor structure has enabled us to see what the hydraulic mill machinery was like. 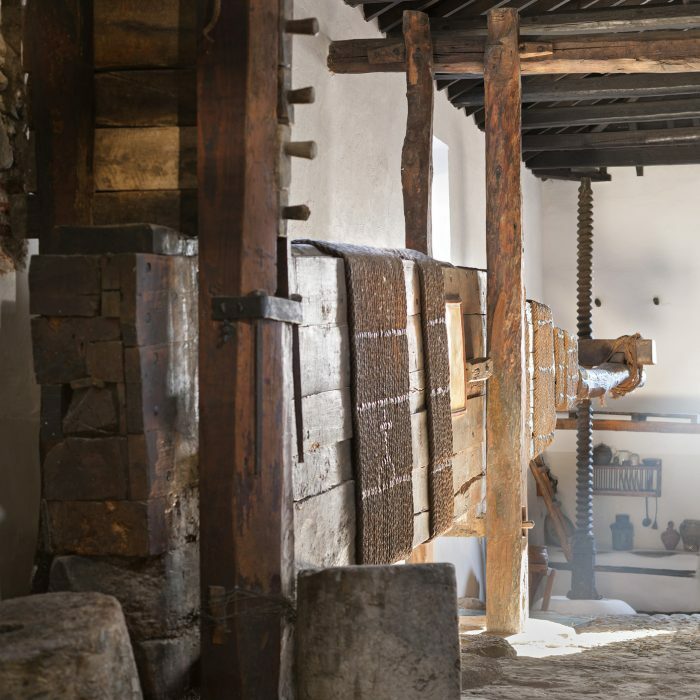 A solid steel water wheel and a timber saetillo that had remained hidden ever since the Almazara ended its oil production days have been discovered.